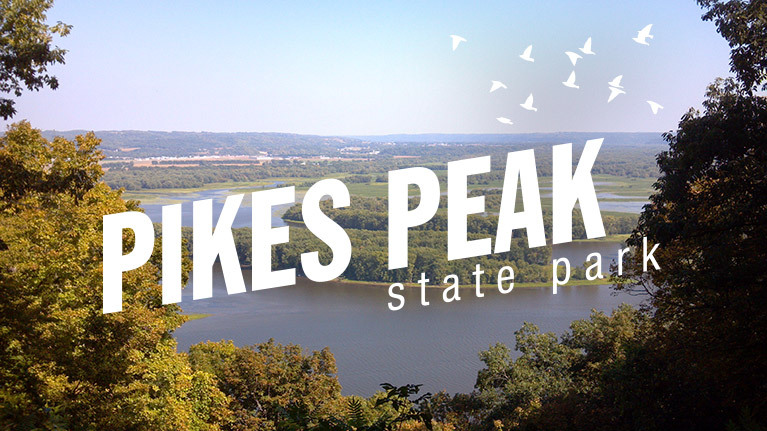 Views from the tallest bluff on the Mississippi River help make Pikes Peak State Park one of Iowa’s favorite scenic attractions. The park is named after Lieutenant Zebulon Pike who recommended the site as a strategic location for a fort. Pikes Peak in Colorado was also named after Lieutenant Pike. Feature attractions at Pikes Peak State Park include: scenic views of the Mississippi River; Native American burial mounds; a challenging trail system; and a popular campground. In addition, there is an area of handicap accessible trails to allow anyone to experience all of these park features. There are many amenities on the south end of the park to accommodate tourists, picnickers and campers. Tourist can grab a snack or t-shirt at the concession stand after taking in the views. Groups and families will find a large parking area, picnic tables, shelters, playground and restrooms available. Campers have access to a modern campground and miles of hiking trails. It’s no surprise that the campground at Pikes Peak State Park is full most weekends. 77 campsites (60 with electrical) are located on top of a bluff with views of the Mississippi River within walking distance. Campsites are shady with gravel camp pads. Most sites are level; however, a few are sloped and require blocking to level campers. The sites are fairly close together, but there are a few private campsites available as well. There’s a modern shower house centrally located with men’s and women’s restrooms and potable water. Another primitive restroom is conveniently placed on the far south end of the campground. The dump station has plenty of room for large RV’s and is situated at the end of the campground loop as you head out. Most of the parks signature features are within walking distance of the campground. I enjoyed getting up and walking the nearby trails to watch the sunrise over the Mississippi River. The 11.56 mile trail system is surprisingly long with three main trailhead areas to start or end a hike. Multiple trailheads can be found at the high point of the park on the south end. The second trailhead access is the at the Homestead parking off of Great River Road. The third trail access area is the lowest point of the trail system at the McGregor parking lot near Point Ann. The clusters of trails around the south parking lot are scenic and manageable for most people to hike. The parks signature sites are in this area and the trails can get busy. In contrast, the trails on the north side of Pikes Peak State Park between Homestead parking lot and McGregor parking lot are more rugged and have less hiking traffic. Parking in either lot will allow for a long loop hike through old growth timber back to your vehicle. There is a 400 ft. change in elevation between the two parking areas; so, you will be doing some uphill trekking on your loop hike. This .37 mile trail is a short and mostly level path from the campground to the scenic overlook areas. The trail has unobstructed views eastward looking over the Mississippi River. Hike this trail early in the morning to watch the sunrise and check out the series of burial mounds along the way. The .4 mile Bridal Veil Trail is popular with tourists that want to see Bridal Veil Falls. Parts of it are handicap accessible with paved sidewalk and the rest is boardwalk with stairs and handrails. There are several scenic overlook areas as well as an effigy mound in the shape of a bear. Myotis Trail Is an .2 mile route that connects with Bridal Veil Trail. It’s a wide path with stairs to help manage the ups and downs. The main feature on the .6 mile East Hickory Ridge Trail is the series burial mounds. There is also a spectacular scenic view at the north end of the trail. If you walk further north on the trail past the scenic overlook, there appear to be more burial mounds. The trail gets rugged and it’s fun to investigate, but use caution. This .5 mile trail is situated away from the tourist sites which make for a quiet walk through the woods. West Hickory Ridge is an invigorating hike when combined with the East Hickory Ridge trail. Weeping Rock Trail is a picturesque 1.89 mile path that connects the north and south trail systems. The winding trail gets its name from water seeping out of the rocks in the ravines. There are many opportunities to see wildlife along the trail under a dense canopy of trees. At 2.8 miles, Point Ann Trail is the longest trail in the park and designated as multi-use for hiking and mountain biking. Starting at the Homestead Parking area this route drops 400 ft. to the McGregor parking lot. Along the way you will travel on a wide path through prairie grasses and dense timber. Point Ann Trail is ideal for mountain bikes and includes points of interest such as the old rock quarry, water reservoir, burial mounds and Point Ann overlook. If you want to beat the crowds and see epic views of the Mississippi River, then don’t miss this 2.5 mile trail. Chinquapin Ridge trail zig-zags up from the McGregor parking area and along a ridge line. As you hike through the forest you will catch glimpses of the Mississippi River to the east. At several places there are leafy framed views of the river below. Look for burial mounds at multiple locations along the way. When combined with Point Ann Trail and Chinquapin Ridge Trail, the 1.8 mile Horn Hollow Loop Trail makes for an exhilarating walk through the timber. Start at the McGregor Parking lot and find either trailhead to go for a hike through pristine old growth forest. This is a nice little .5 mile connector trail amid prairie grasses, wild birds and insects. This trail can help complete a loop hike when combined with Point Ann and Chinquapin Ridge trails. From the parks historical relevance to its natural beauty, Pikes Peak State Park packs a lot into the sliver of land it occupies along the Mississippi River. It’s mesmerizing watching the river activity, like massive barges moving down the main channel, eagles flying and flocks of birds passing by. My favorite trail was definitely the Chinquapin Ridge Trail. I was able to sit on a bench and eat my lunch with a postcard view of the river. A close second would be Horn Hollow Loop Trail because it felt peaceful and untouched. Had I brought a mountain bike, there is no doubt that the Point Ann Trail downhill run would be on my list of favorites too. This park is rich in history and tradition. One family gathering I ran into arrived before sunrise as they do on the same weekend every year for a sunrise picnic. Another couple walks the long loop trails every weekend they can. I don’t live close enough to form a regular tradition, but I know I will return. I’m doing a small spiral bound book about the architect, Frank Lloyd Wright. I would like to use a photograph that shows the view from Iowa’s Pike’s Peak looking out over the Wisconsin River. I would prefer an autumn scene or something similar to your second photo on your website. Would you have something I could use? I would give your website credit (or you personally) if I used it. Hope to hear from you. Sorry Paul, I don’t have any autumn photos of Pike’s Peak. Thanks Matt, I’m sorry for the rather late response. I’m now wondering if I might use one of these summer Pike’s Peak views that you have included in this website. If so, can you tell me how to properly credit the image? Many thanks for your help.